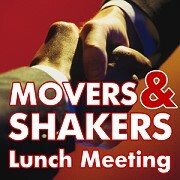 Movers and Shakers is a new Atlanta REIA educational and networking group led by Gordon Catts that is designed to meet the interests of intermediate and advanced investors rather than new investors. The group meets on the 3rd Monday of each month at the 5 Seasons Brewing located at 3655 Old Milton Parkway in Alpharetta, GA. The doors open at 11:00 AM and the program officially starts at 11:30 AM. Atlanta REIA members can attend at no charge and non-members for $5.00. The brewery provides us with a private meeting room with the understanding that we will purchase food and beverages. We also ask that you tip the wait staff generously for good service. Our weather policy is that of the Fulton County Schools. If the Fulton County Schools are closed for weather, we will not meet.